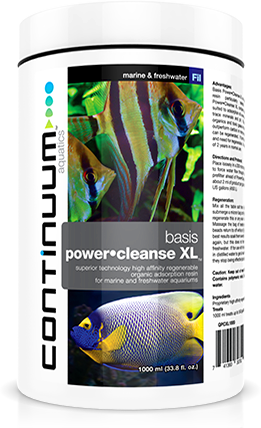 Basis Power•Cleanse XL is a supreme quality high activity synthetic filtration resin particularly selected for sensitive aquarium environments. Power•Cleanse XL contains huge numbers of mesopores and macropores suited to adsorption of a wide range of organic pollutants with zero impact on trace minerals and pH. Power•Cleanse XL will remove stains, dissolved organics and toxic gases in marine, brackish and freshwater systems. It will outperform carbon in many environments and is more economical because it can be regenerated. It turns brown or shades of yellow indicating exhaustion and need for regeneration. It is regenerable over and over again for a minimum of 2 years in normal use. Place loosely in a 200 micron polyester filter bag or filter chamber and position to force water flow through the product. For best results, use a particulate prefilter ahead of Power•Cleanse XL, such as filter floss or fine sponge. Use about 2 ml of product per gallon of aquarium capacity, or about 1 cupful per 120 US gallons (450 L). Mix all the table salt that will dissolve in a quantity of water sufficient to submerge a micron bag containing the beads. (CAUTION!! never use bleach to regenerate this or any resin. It can kill your fish and will damage the resin). Massage the bag of beads by hand in the brine (wear rubber gloves), until beads return to off white or light cream color - or until they stop lightening. For best results soak them overnight. They will probably never return to snow white again, but this does not hinder their effectiveness. Rinse several times in freshwater. If for use with freshwater fish, it is best to soak them the final time in distilled water to get all remaining salt out. Reuse as before. Discard when they stop being effective (as indicated by color). Caution: Keep out of reach of children. Not for human consumption. Contains polymeric resin, if ingested drink water. If in eyes flush with water. ©2017 Continuum Aquatics. All rights reserved.